This chest features an attached electrical outlet for convenient and easy device set up. Cord holes cut into the back of the piece prevent you from needing to snake extension cords and extra wiring across your bedroom floor, and instead safely connect your media consoles or television directly to the chest. Hide wires, organize your devices, and never worry about tripping over cords on the floor again with the included electrical outlet. 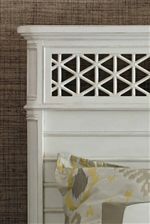 Charming cottage-influenced honeycomb patterns combined with crisp lines provide a fun and casual look. Loaded with functional purpose, this media chest includes a fold down drawer with a hidden power strip for aesthetics and beneficial utility. All drawers come with fully extending guides for ease of use. 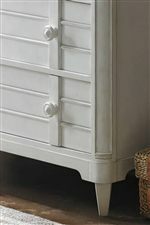 The Cypress Grove Cottage Style Media Chest with Fold Down Drawer by Stanley Furniture at AHFA in the area. Product availability may vary. Contact us for the most current availability on this product. Drawer / Shelf Construction English Dovetail Construction. Fully Finished Drawer Interiors Built with Wood Species to Match Outside of Case. The Cypress Grove collection is a great option if you are looking for Cottage furniture in the area.